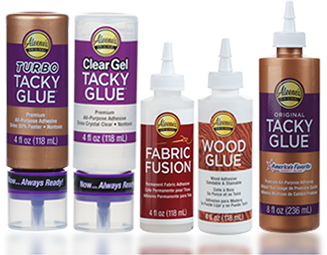 Aleene’s Original Glues - Can I crackle glue with Aleene’s glues? Can I crackle glue with Aleene’s glues? Paint object with a basecoat of acrylic paint. Let dry. Brush an abundant layer of Tacky Glue over the dried paint in the areas you want to crackle. Let the glue set until it reaches a tacky phase, but does not completely dry. While the layer of glue is still tacky, brush the same color of paint or a contrasting color over the glue, brushing only once instead of back and forth, as that could hinder the crackling process. As the paint and glue completely dry, they will naturally crackle. Let dry completely. Protect project with your favorite sealer.